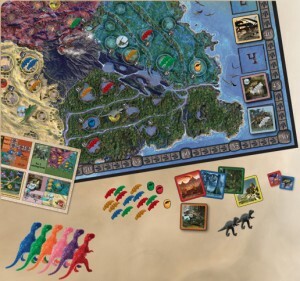 Triassic Terror is a dinosaur-themed, area control game by Peter Hawes – designer of Francis Drake (I will be reviewing this soon), Wars of the Roses and Heads of State. 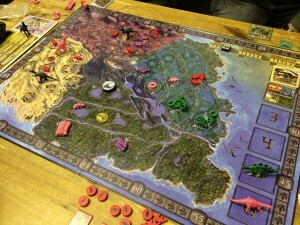 During the game, players try to dominate the landscape by growing their dinosaur herds and moving them from area to area. The board is split into 4 different terrains which are each split into 3 areas. There are 3 positions within each area – the largest herd in an area takes the best position, second largest takes the next one, and third largest takes the last one. If there’s a fourth herd in an area, it immediately dies – welcome to the harsh brutality of Triassic Terror.